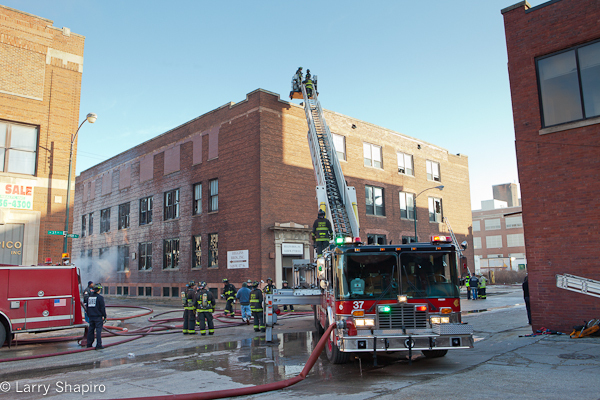 At approximately 8AM this morning the Chicago Fire Department received a report of black smoke coming from a four-story warehouse at 1427 W. 37th Street. 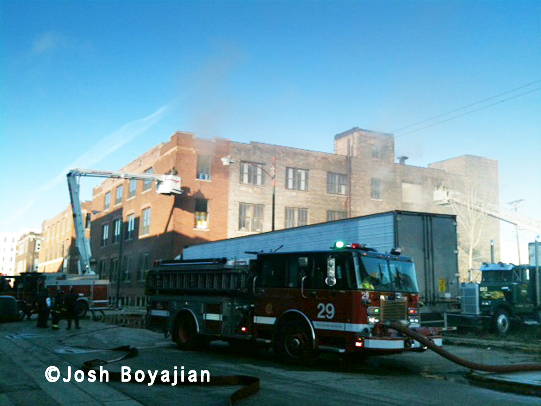 First arriving companies reported a fire and the alarm was elevated to a 2-11 within minutes. A 3-11 was struck roughly a half hour later which was struck out around 9:30AM. 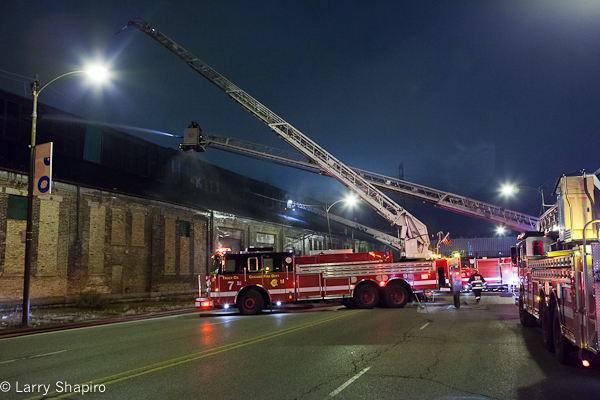 Three tower ladders and the Snorkel from Squad 1 were all working along with one multi-versal and hand lines. 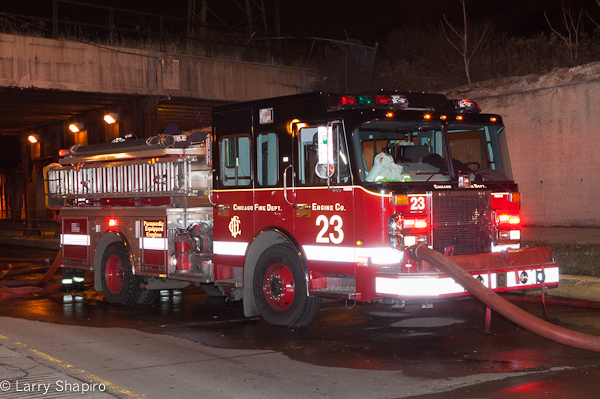 Seven engines (19, 28, 29, 39, 49, 50, and 65) were working at the scene as well. 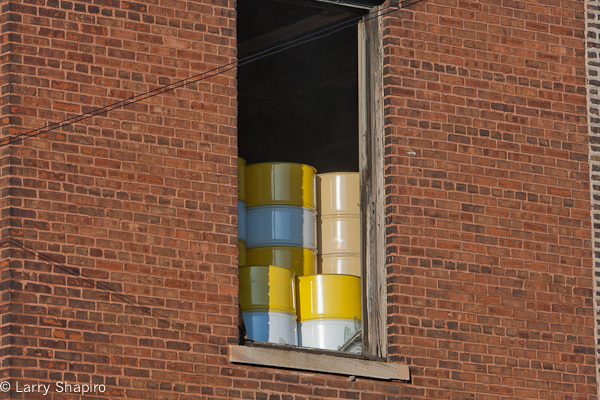 A Level I Haz Mat was requested when companies discovered stacks of 55-gallon drums inside the building, but the drums turned out to be empty as the building’s occupant is a manufacturer of industrial drums and containers. 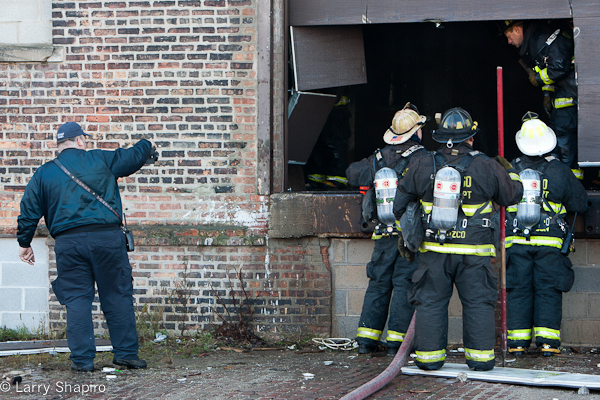 The Chicago Tribune has an article on the fire HERE. 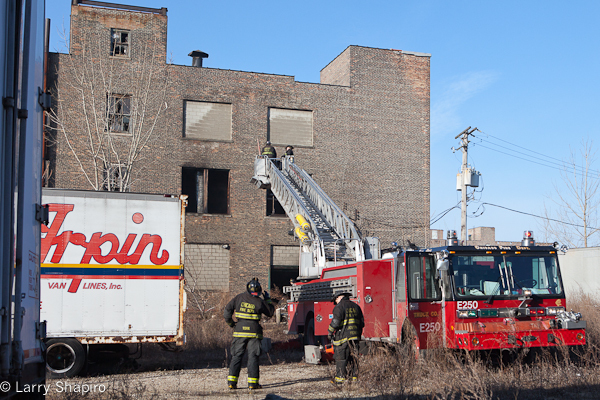 Larry Shapiro and Tim Olk were at the scene as well as several other photographers. A gallery can be found HERE. 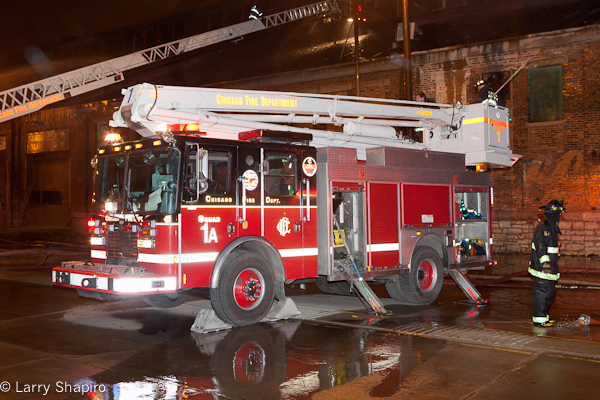 Pierce is recalling 724 trucks. The recall affects the model-year 2007-2011 Arrow XT, model-year 2008-2011 Custom Contender, model-year 2008-2011 Impel, model-year 2008-2011 Quantum, model-year 2009-2011 Saber, and model-year 2007-2011 Velocity. 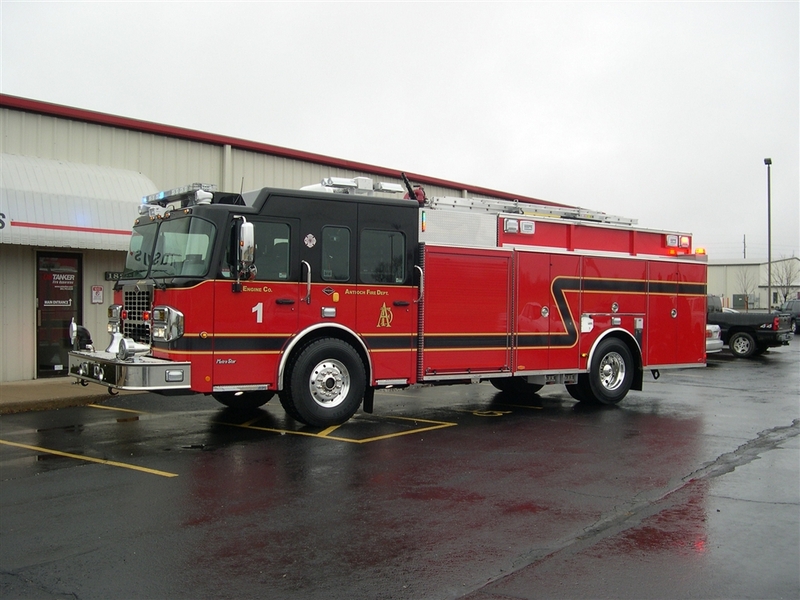 E-ONE is recalling certain model year 2008 through 2011, Cyclone II, Typhoon and Quest vehicles manufactured from May 1, 2008, through Nov. 28, 2011. Ferrara recalled 104 model-year 2009-2011 Inferno and Igniter vehicles. The recalled trucks were manufactured between April 2009 andOctober 2011. 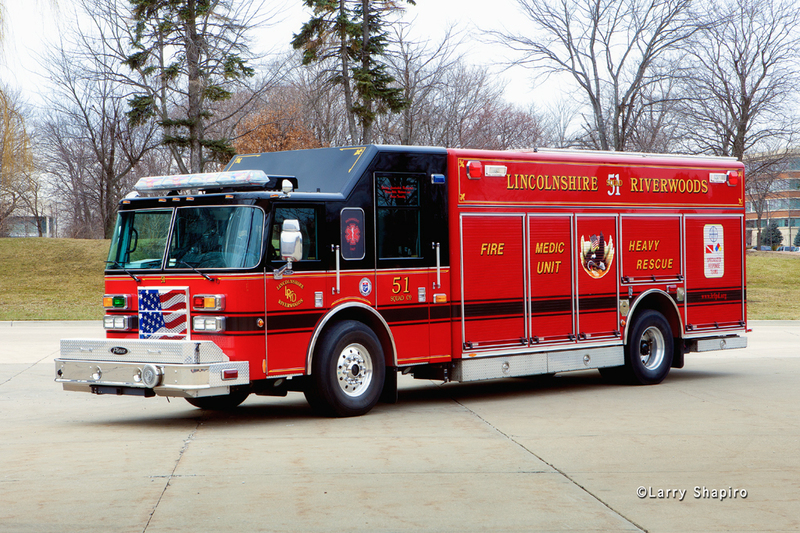 Sutphen is recalling certain 2009–2012 model-year vehicles. 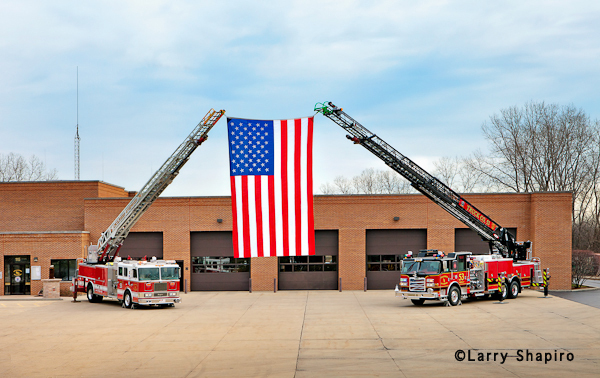 America LaFrance is recalling certain model year 2010 and 2011 Eagle Fire trucks manufactured between Oct. 21, 2010, and Aug. 25, 2011. 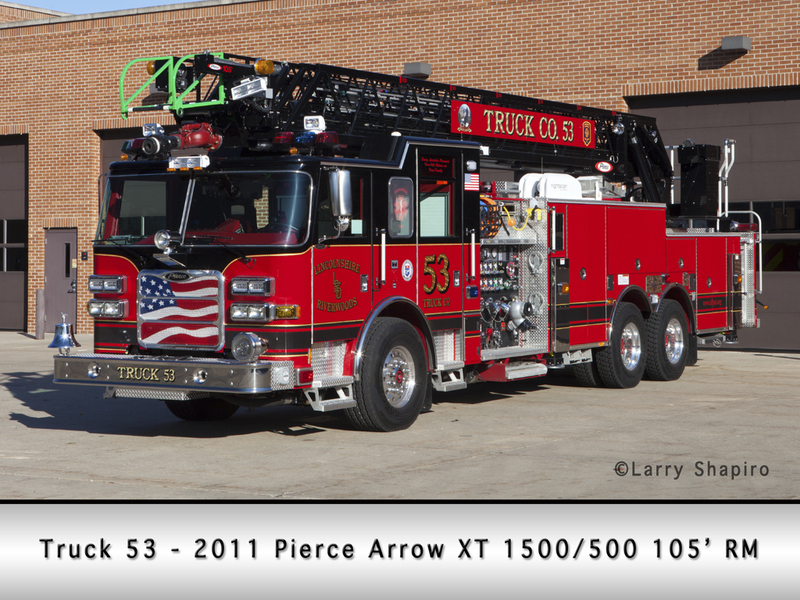 HME is recalling certain 2009–2012 model year fire trucks manufactured between Jan. 16, 2009, and Nov. 1, 2011. MERITOR WABCO IS RECALLING CERTAIN ELECTRONIC STABILITY CONTROL (ESC) MODULES WITH PART NUMBERS 446 065 020 0, 400 850 179 0, 400 850 195 0, 446 065 027 0, AND 400 850 185 0, SHIPPED TO A VARIETY OF NORTH AMERICAN VEHICLE MANUFACTURERS FROM AUGUST 2005 THROUGH SEPTEMBER 2011. UNDER CERTAIN ROAD AND DRIVING CONDITIONS, VEHICLE BODY ROLL AND ROAD INCLINATION CHARACTERISTICS MAY ADVERSELY AFFECT THE SLIP ANGLE CALCULATION OF THE ELECTRONIC STABILITY CONTROL (ESC) SYSTEM. THIS MIGHT CAUSE THE ESC TO PERCEIVE AN OVER STEERING SITUATION AND THEREFORE APPLY THE OUTER WHEEL BRAKE ON THE FRONT AXLE UNTIL THE VEHICLE IS PERCEIVED TO BE STABLE. IF THE DRIVER IS SLOW TO REACT DURING THIS ESC INTERVENTION, THE VEHICLE MAY DEVIATE FROM THE INTENDED LINE OF TRAVEL, INCREASING THE RISK OF A CRASH. MERITOR WABCO IS WORKING WITH THE VEHICLE MANUFACTURERS TO IDENTIFY AND NOTIFY VEHICLE OWNERS OF THE RECALL. OWNERS MAY CONTACT MERITOR WABCO AT 1-248-435-8001 OR THEIR VEHICLE MANUFACTURER. 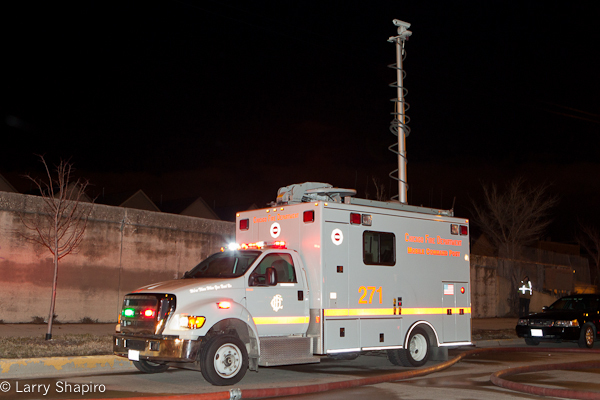 A new Ford E450/Illinois Bus Sales unit which will serve the dive team and as a rehab unit. 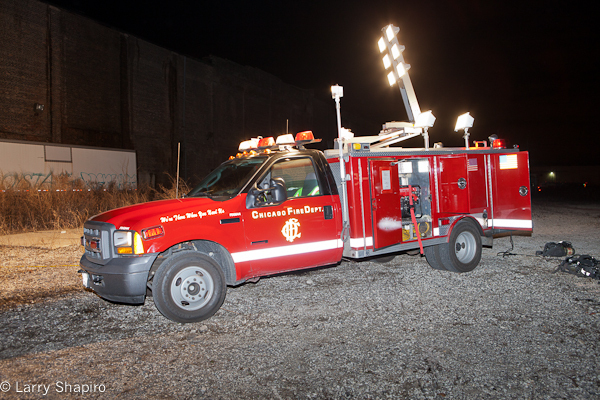 This new unit is now in service. 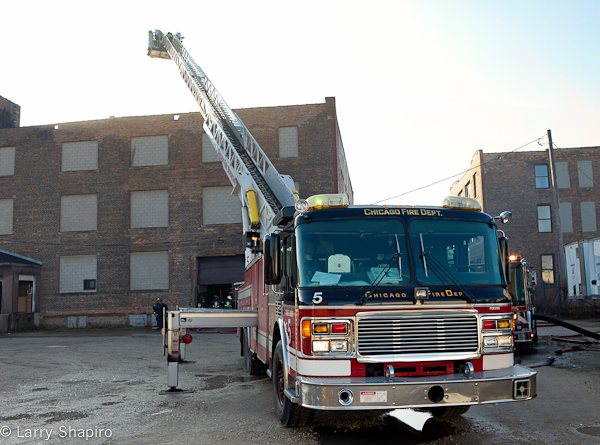 Chicago companies were dispatched to a reported fire Tuesday evening at 2626 W. Roosevelt Road, a vacant, block long building bounded by Washtenaw and the railroad tracks. 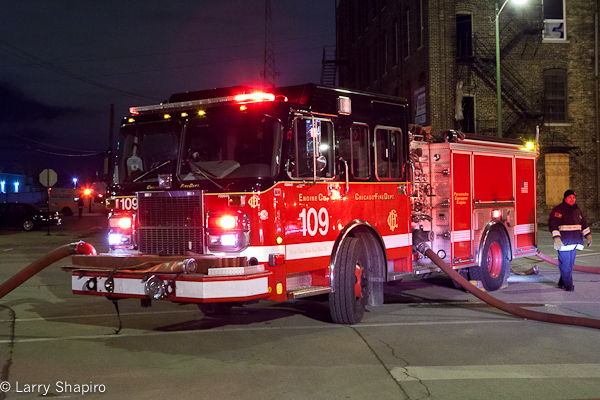 Engine 107 whose house is around the corner was first on the scene and reported fire on the second floor. 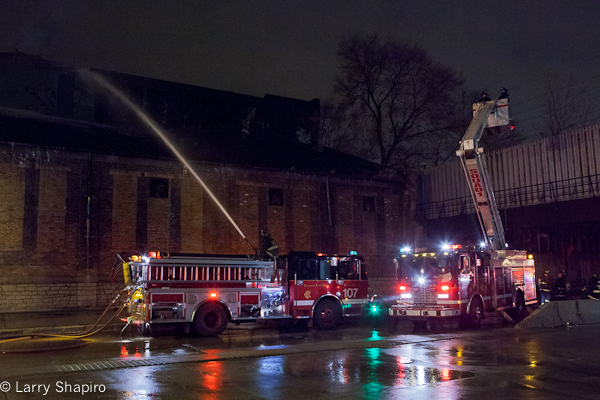 Battalion 4 requested a still and box alarm reporting a two-story, large brick warehouse. 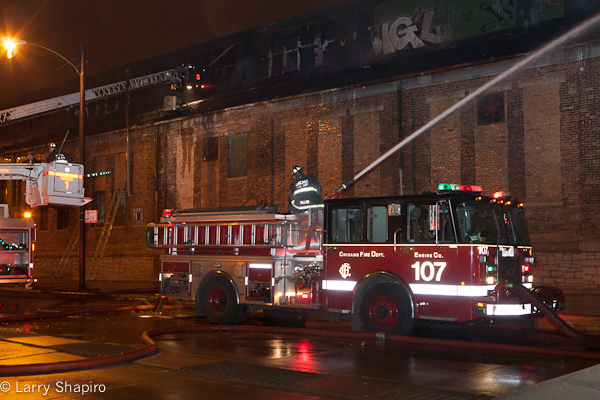 Early on the fire fight went defensive with elevated master streams and a deck gun from Engine 107. 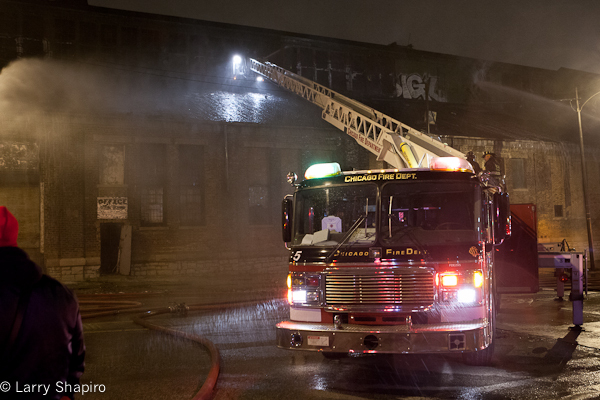 The fire was upgraded to a 2-11 within about 20 minutes and a 3-11 was requested a half hour later by 2-1-22 when there were no longer companies in the staging area. A Level I Haz Mat was also requested after the 3-11 was in. 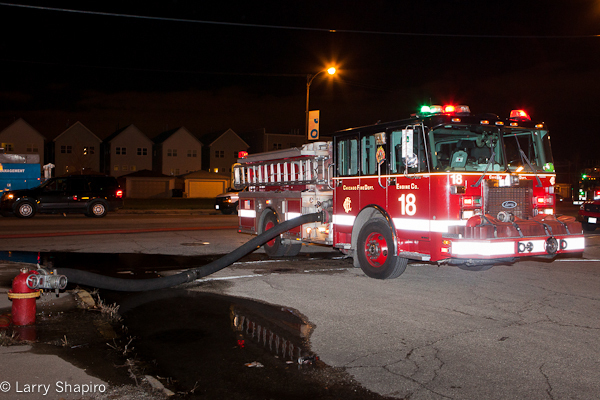 Tower Ladder 5, Tower Ladder 10 and Squad 1’s Snorkel were working with master streams on Roosevelt Road. 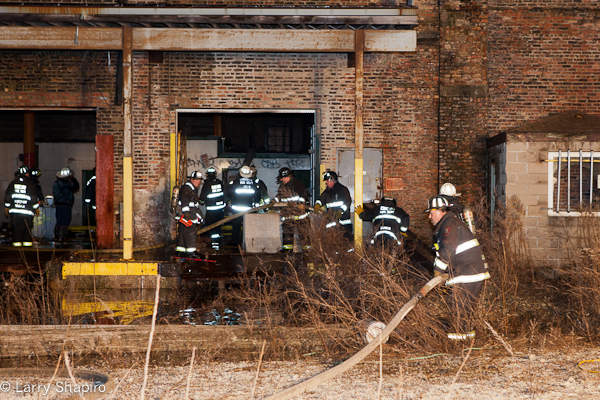 Roughly an hour into the fire companies began moving inside to hit the remaining spot fires before the fire was struck out between around 9:30PM. Tim Olk and Larry Shapiro went to the scene. 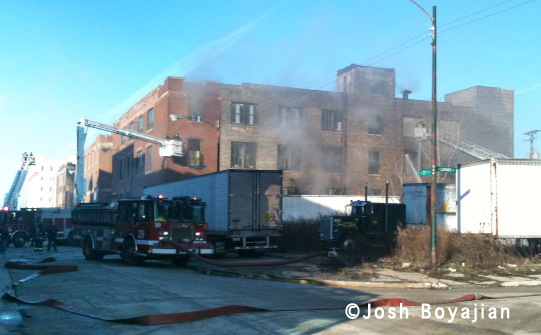 Tim reported early on that smoke was heavy and banking low on Roosevelt Road. There was not much fire to be seen and photographed. Larry has a gallery that can be found HERE. 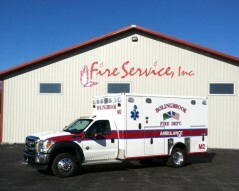 Martin Nowak spotted Bolingbrook‘s new ambulance (which was mentioned HERE) on the Wheeled Coach site HERE. 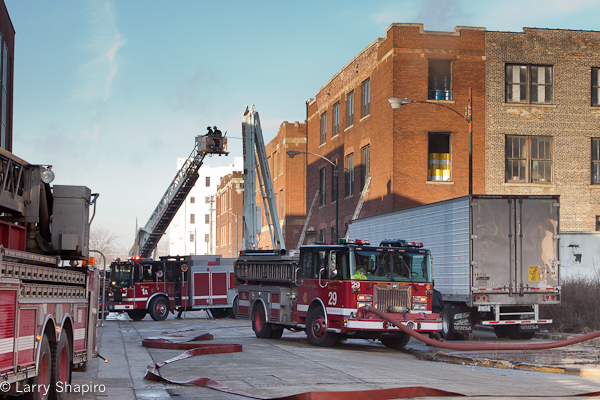 Dan McInerney submitted images of Engine 8 and Truck 4’s house in Chinatown. 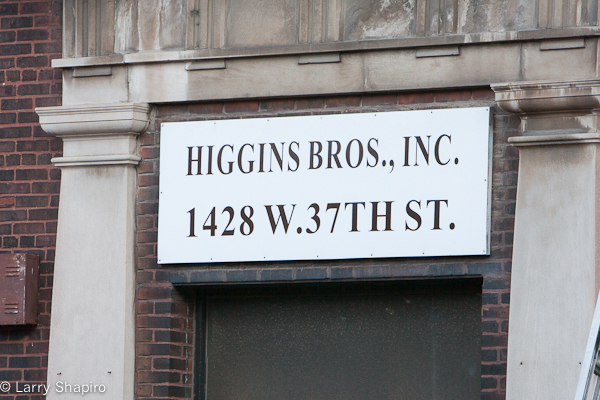 The house has squared off doors, whereas the image currently on the web site shows the original arched doors. 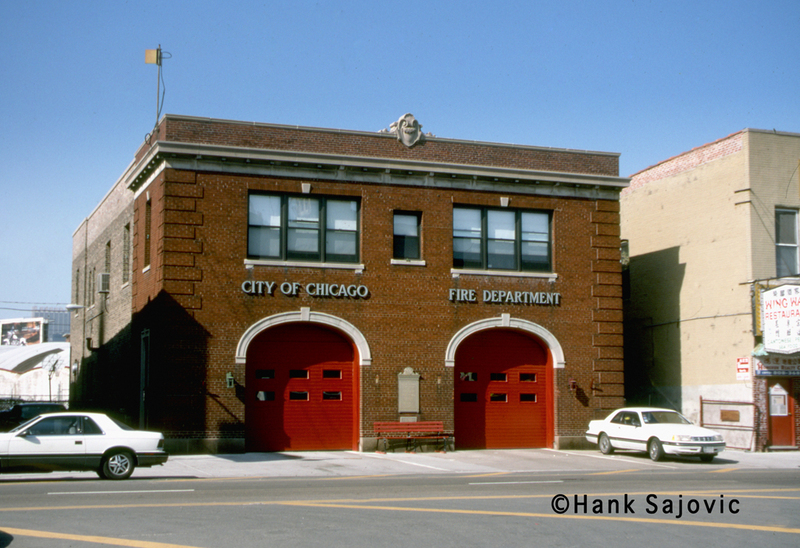 Currently, there is a senior alarm board operator assigned to the Englewood and the Main operations per shift. As of January 1st, one person will oversee both sides of the city. According to the Occupy Office of Emergency Management and Communications (OEMC) Facebook page, pink slips and letters of demotion were passed out to 911 operators on Friday, December 16, 2011. 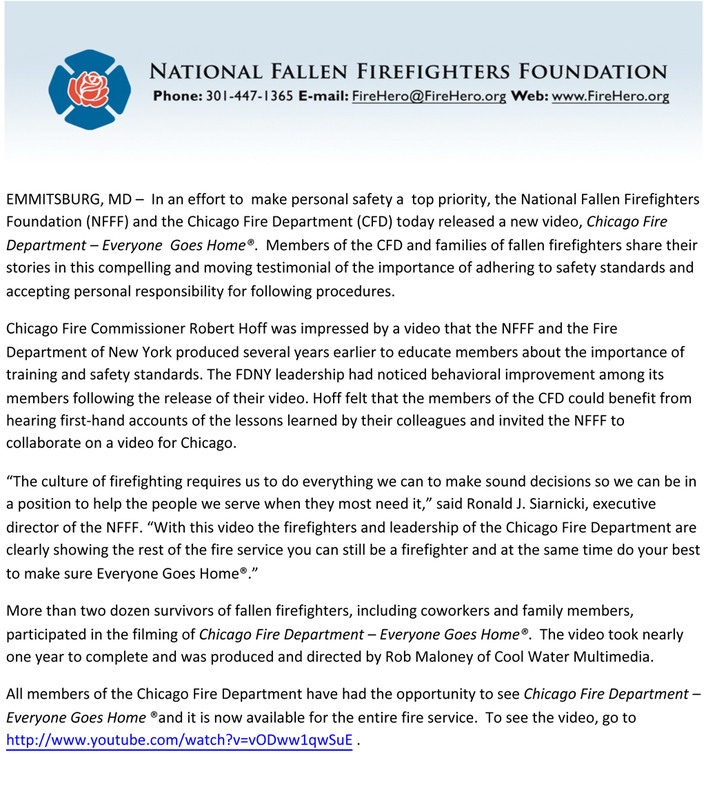 Also, Office of Emergency Management and Communications supervisor Shanita Carter talked about the consequences of laying off already understaffed and overworked 911 call takers. Carter says the supervisors cannot be stretched thinner than they already are. Earlier this week, 28 aldermen signed a letter of concern over city budget cuts, saying some of them go too far. 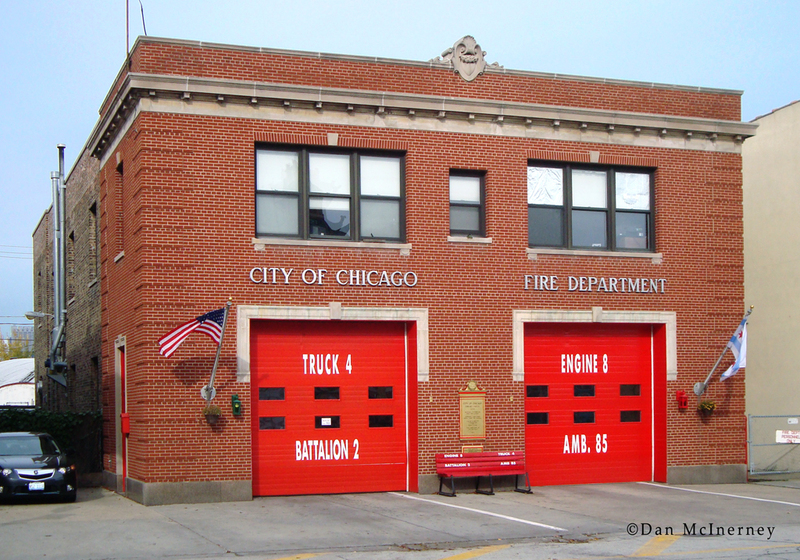 Cuts to the OEMC were of particular concern, as were cuts to the libraries, Emanuel’s which would result in the layoffs of scores of employees. 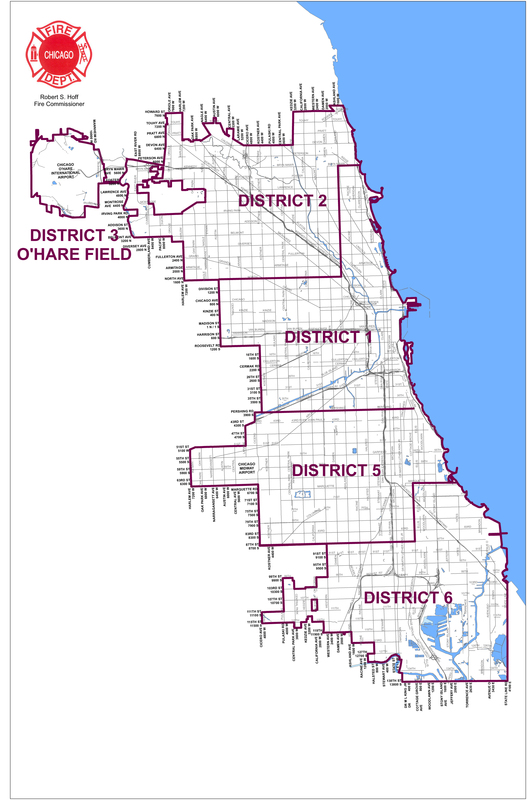 Here is a new map showing district boundaries for the CFD without the 4th District. Main east/west dividers are North Avenue to Ashland then north to Bryn Mawr, Pershing Road all the way east, and 87th Street to Cottage Grove, then north to Marquette.